A failed cotton field in Texas stretches to the horizon. Rainfall in the region had previously averaged 17 inches a year, but in 2011 and 2012 the annual averages were 3 inches and 8 inches. 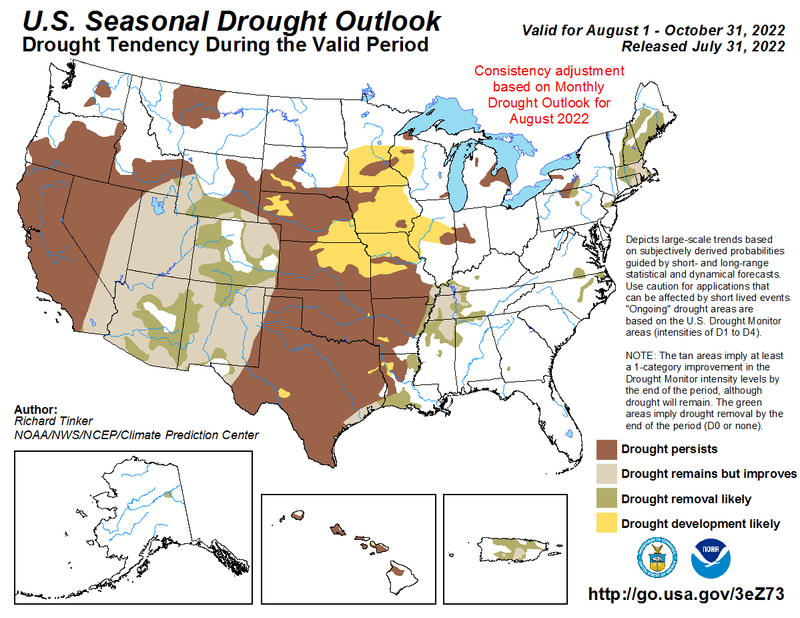 Officials from the Department of Agriculture’s Natural Resources Conservation Service predict that drought conditions in central Nebraska, western Kansas and the panhandles of Oklahoma and Texas will persist or intensify in 2014. The predictions come as part of the service's first National Water Forecast report for 2014. Conditions could also worsen in parts of Iowa, Wisconsin and Minnesota, according to the report. 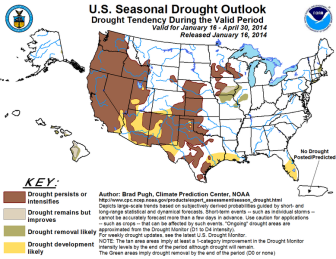 Drought conditions will most likely affect the western United States the most. Drought conditions are projected to persist or intensify for much of the western United States, according to Natural Resources Conservation Service predictions. Click on the image to view a larger version of the map. 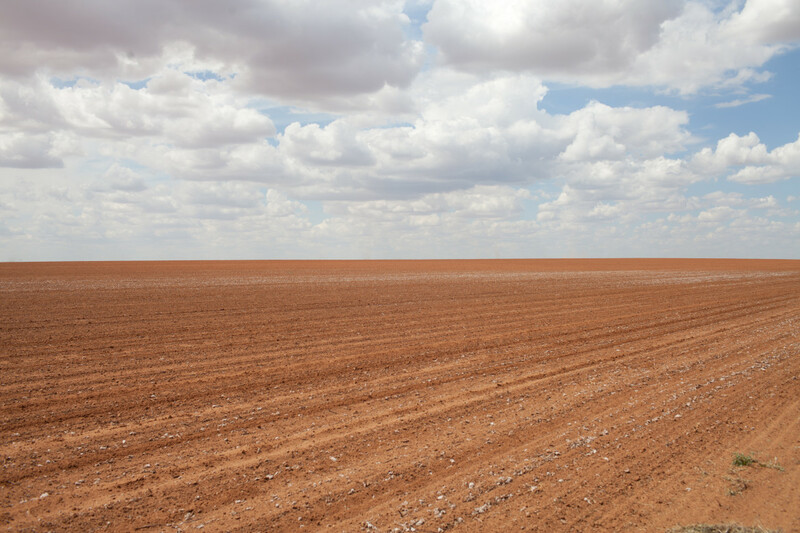 The forecast report states that the area starting in western Oklahoma and Texas, moving west to California and stretching north through Washington is listed as having severe to exceptional drought conditions. “Right now the West Coast is all red,” said Tom Perkins, a hydrologist for the National Resources Conservation Service, in a news release on the forecast. Information shows that California experienced its driest year on record this past year. As a result, once agriculture-rich areas in the state are now faced with reduced crop production and are currently selling off livestock to stay in business. California’s Paso Robles and King City received less than 2 inches of rain in 2013. The average is nearly 13 inches. The Big Sur area, which has suffered from recent wildfires because of drought, was nearly 38 inches below average rainfall levels, according to data from the National Weather Service. In addition to monitoring drought conditions and precipitation, researchers are also monitoring snowpack levels in more than a dozen western states. Researchers predict that areas in Nevada and Idaho will be hit with "exceptional drought," while parts of Texas, Oklahoma, Colorado and California will be hit with "extreme drought." Click on the image to view a larger version of the map. The runoff from melting snow is a much-needed source of moisture. Farmers and ranchers rely on the increase in river water from the melting snow to hydrate their crops and livestock. A decrease in runoff from snowpack could also lead to drought conditions and water shortages in some areas. 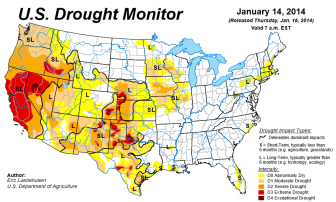 Along with the drought predictions, the forecast report also provided some possible good news for farmers and ranchers in the corn-belt and the other parts of the country. Researchers with the conservation service expect that drought conditions will dissipate in southern Iowa, northern Missouri and parts of Illinois in 2014, and anticipate that the southern and eastern United States will experience an overall average year for moisture.